SUPER FAST BUT FABULOUS CREATIONS! GREAT WITH KIDS AND ADULTS ALIKE. I'M THE SOLE ARTIST OF RAE'S FX AND BASED RIGHT HERE IN PERTH --- BUT IF YOU NEED MULTIPLE PAINTERS, I WILL GET THE BEST PERTH HAS TO OFFER TO JOIN ME! ​Perth kids love face painting! Let me bring a splash of colour with some fun and laughter to all the faces of Perth, WA. FACE PAINTING PARTIES are a huge success with children of all ages. Adults can sit back while the kids are entertained with beautifully painted designs (or they can join in too!). Fairies, Goblins, Butterflies, Dragons, Spiderman, Tigers, Princesses the list goes on, your guests will be amazed by the effortless, flawless designs. Ensure your corporate function is a huge success with adults and kids. The face painter is always the busiest person at any fete, carnival or fair. This is because we all love to have our face painted. Childrens parties, fancy dress parties, school plays, daycare parties, christmas parties, fetes, fundraisers, masquerade balls, vacation care programs, theatre productions, picnics, sporting events, play groups - A face painter is a hit at all these special occasions. Or why not book me, Rae, for your family wedding or family party, the kids will love being painted by me while the adults relax. Face Painting is fun for any occasion and I can paint anything you can think of. Have a look through my gallery for samples of my work, then pick up the phone and book me, I PROMISE you won't be disappointed. I use only the best professional and safe FDA approved cosmetic grade face paints. Get your face painted!! Make a booking today! 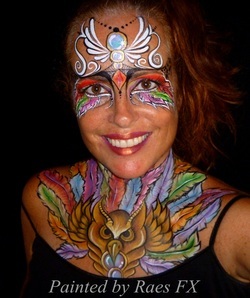 Raes FX Face Painter & Body Artist - Morley, Perth, WA. Servicing Perth Metro area. Will travel most areas NOR or SOR.